A classic fable is retold but in a unique environment! -- in Hare and Tortoise Race Across Israel. I may not be as fast as a train, but I am certainly faster than you, Hare tells his friend Tortoise. They embark on a race from Tel Aviv to the Dead Sea. As the animals race across the country, they re drawn not to well-known landmarks in Israel, but are instead seen enjoying slices of everyday Israeli life. 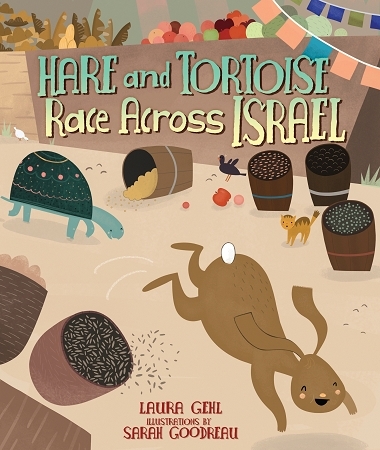 Hare watches soccer games and street performers while Tortoise enjoys falafel and rugelach; they see the cities of Jerusalem and Tel Aviv, but also the Judean Hills and the desert. This sweet story celebrates kindness and friendship, even in the midst of competition. While Hare races on ahead, Tortoise takes the time to call Shalom! to everyone he passes, and even offers Hare some of his falafel. A familiar story, with just enough unique detail to paint a picture of contemporary Israel. "Instead of teaching the value of slow and steady progress, this version of the fable says: Stop and look around; there are olive groves and persimmon trees . . . There are animals everywhere: whales and ravens and swimming camels. They're made up of bold, geometric shapes in gorgeous pastel colors. If the story teaches any lesson at all, it's this: A short attention span can be a glorious thing, particularly in a place like this." "Working in a milky, muted palette, Goudreau's crisply defined illustrations successfully capture Israel's urban bustle, geographic diversity, and leisure attractions, including the friends' dip in the Dead Sea afterward."